Social media satirists Bermemes released their 2013 Christmas jingle Decked Right Out (We All Done Dat) at their party at Chewstick last night. The song, a Bermy version of Deck The Halls, is their second annual Christmas song - Last year they produced a comic version The Twelve Days of Christmas that attracted over 2,000 hits online. 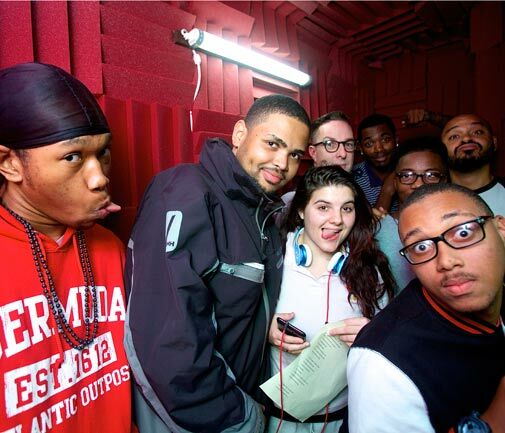 The 2013 song includes guest performances by Dem Biez, Gavin Smith, Najib Chentouf, Tanaya Christopher and Mike Hind. The 'Crissmis Party' was full of fans and supporters who had come out to celebrate a successful year for Bermemes made up of Dejon Simons (CEO), Karriem Sherriff, Makeen 'Haz' Bartley and Eilzabeth Varao. Their website bermemes.com and social media posts satirise life on the rock and have attracted an international fan base. Simons told the Bermuda Sun there are many exciting plans ahead for the group in the New Year.